A. If you are going to a convention, belong to a reading group, or patronize a library or bookstore open to taking promotional items, and! you would like to help promote Agent of Change and/or the Carousel series, please drop me a note at sharonleeATkorvalDOTcom, and I’ll be happy to send you some postcards or bookmarks for distribution. 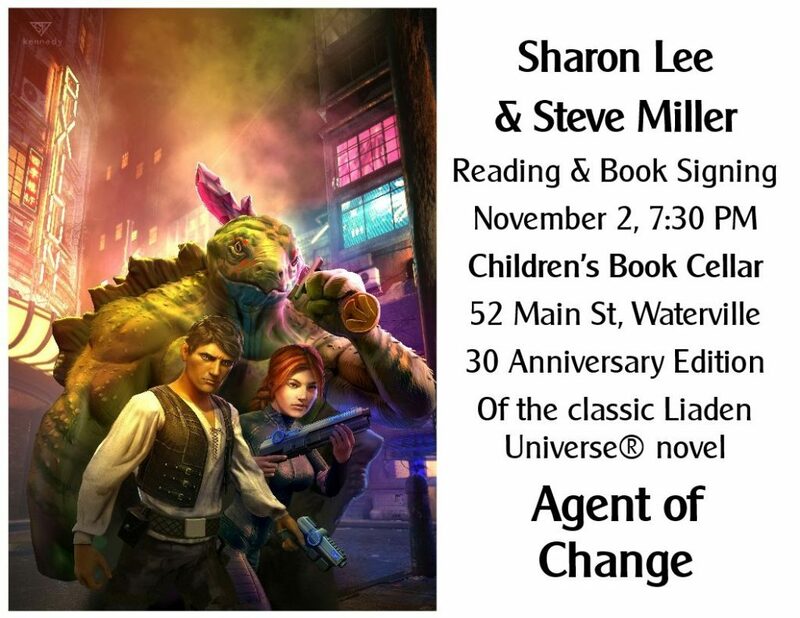 B. Sharon Lee and Steve Miller will be reading from and signing copies of the Thirtieth Anniversary Edition of Agent of Change at Children’s Book Cellar, 52 Main Street, Waterville, Maine 04901, on Friday, November 2, from 7:30-9 pm. Looking forward to seeing you — yes, you! — there. C. If, after all, my blandishments have failed and you are unable to attend the November 2 event, and you still want a signed copy of the anniversary Agent of Change, with the awesome Sam Kennedy cover, you may send an email before November 2 to Ellen Richmond at kidsbookscellarATmyfairpointDOTnet, with “Lee and Miller” in the subject line. In the body of the letter let Ellen know how many books you want, your snail address, and any personalization request you may have. She will contact you for further necessary information. Here endeth the Wednesday morning adverts. I’d forgotten how great that cover is.